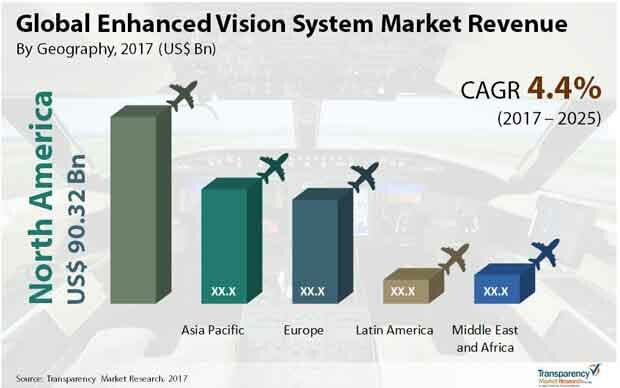 Global analysis of the enhanced vision system market has been provided under the scope of this report for the period of 2017-2025. This market has been segmented into system, components, application and geography that are covered within this report. The in-depth analysis of the various factors affecting this market along with challenges posed within this market are also considered here. Enhanced vision encompasses technology which incorporates information from sensors based in aircrafts that displays electronic real-time images of the external surroundings achieved with the application of image sensors. This helps flight crew members and pilot with a sensor-derived enhanced image of the terrain even at extremely low light. These images are formed by monitoring and capturing of infrared energy radiated from objects forming a real-time video image displayed on a dedicated video display screen. Synthetic vision system also provides images showing contrast between different objects only without the help of sensors. All these systems have been great in enhancing the safety related to the aerospace sector and is expected to grow in the next few years as well.